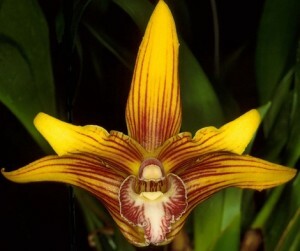 The Maxillaria (max-ih-LARE-ee-uh) orchid produces small blooms that are often fragrant. Maxillaria flowers come in an array of colors such as white, yellow, brown, all shades of red, dark purple, and even pretty close to black. Maxillarias can also sometimes give the appearance of little flames due to their coloration, and others are yellow with brown colored stripes resembling a tiger’s coat. The blooms of the Maxillaria orchid come in a wide range of sizes. Some are only a mere half-inch in diameter whereas some can reach a diameter of up to six inches. They usually have an overall triangular shape. Short flower spikes grow from the base of the pseudobulbs, and each usually produces a single bloom. Maxillarias grow in a wide range of elevations, from sea level all the way to 12,000 feet. Because the range of elevation differs so greatly, so do the cultural requirements for each variety. For this reason it may be a little tricky to find the right conditions for the exact type of Maxillaria that you have. Although once you know the specific type of orchid you have, you will be able to research its natural habitat so that you can modify its growing environment as best you can. Watering frequency – as covered in this article about watering orchids – can be determined by a few different things. A Maxillaria orchid should be watered regularly. You will want to make sure that the medium does not stay too wet or too dry. You will want to find a happy medium. If the pseudobulbs start to become wrinkled in appearance, this is an indication that the orchid needs to be watered again. As a rule of thumb, you will want to water more frequently during the warmer months (generally more than once a week) and less frequently in the cooler months. As covered in this article about orchids care and light, for the most part, Maxillarias thrive with bright but indirect light conditions, however, it is important to determine the variety you have and adjust accordingly. A great inside location to place your Maxillaria is on a western facing windowsill or within a foot of a southern facing windowsill. You will always want to make sure that your Maxillaria is in indirect sunlight exposure so that the leaves do not become damaged and sunburned. As discussed in this orchid plant care article on temperature, the temperature requirements for Maxillarias are daytime temperatures somewhere between 70°F to 85°F (21.1°C to 29.4°C) and night temperatures between 55°F to 60°F (12.8°C to 15.6°C). Depending on which variety of Maxillaria you have will determine if your orchid requires lower or higher temperatures. Higher elevation species need cooler temperatures and lower elevation species can handle temperatures that are a little warmer so it is important to determine where your specific variety is from. As covered in this “humidity” article on how to care for orchids, Maxillarias thrive in humid conditions. The ideal amount of humidity for a Maxillaria orchid is between 40-70 percent. If you need to increase the humidity for your orchid, you can add a humidity tray or humidifier. It is also important to remember that the more humid you keep the orchids environment, the more air movement your orchid will need to help prevent any disease. Maxillaria orchids should be fertilized twice a month using a diluted (20-20-20) fertilizer solution. You should flush your orchid with water once a month in order to remove excess salts and fertilizer which can build-up over time and cause damage. Maxillaria orchids are a type of orchid that doesn’t like to be disturbed, and they do best with as little disruption as possible. They have fine roots and should be repotted in a fine-grade potting mix only when you see both new roots and new growth appearing. A good potting media mix is sphagnum moss mixed with fine grade bark. The moss helps retain some moisture but at the same time the bark allows for proper drainage. Normally when you notice yellow or brown roots on your orchid, you assume that the roots are dead, however, on a Maxillaria orchid these are quite common and even healthy. The roots tend to turn green when you water them. Maxillaria orchids also grow well when mounted or grown in slat baskets. #1 – More Free Maxillaria Tips! If you’d like to learn everything you need to know about Maxillaria orchid care (and caring for ALL types of orchids) we also have something called the Orchids Made Easy Green Thumb Club.